I know there are those among us that love to exercise. However, I am not one of those people. Unfortunately, I am also old enough to know that if I don’t start incorporating some cardiovascular activities into my life, I’m going to have a problem. I’ve been on the lookout for an effective, relatively painless exercise option, and hadn’t really found anything that I thought I could stick with. I sure wish browsing the internet was exercise, I’d be 10 pounds lighter, with muscles of steel. Well, check out the FitDesk! 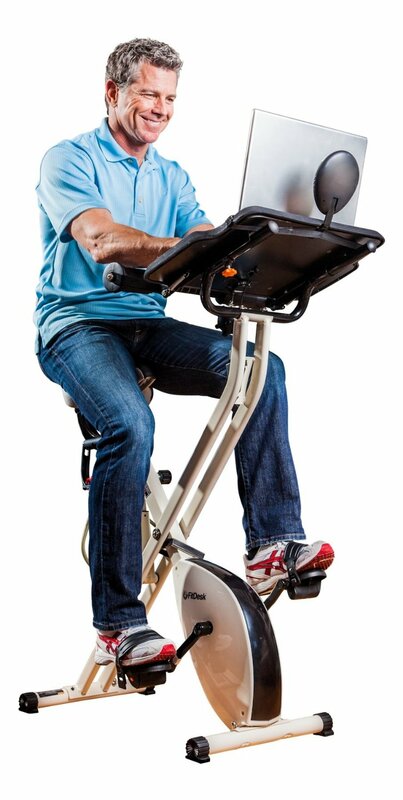 A foldaway exercise bike that lets you pedal while you work. The FitDesk allows you squeeze in some much needed exercise while you answer some e-mails, surf the web, or play a game. Cycling is great for you, and with adjustable resistance settings you are sure to get a varied, and energetic workout. You can also use the included (and convenient) upper-body resistance bands for an added cardio boost. FitDesk’s unique backrest and extender allow for both upright and semi-recumbent use, and whichever you choose, you have easy access to the FitDesk platform where you can securely fasten your laptop. The desktop features a non-slip surface, and even includes massage rollers positioned to somehow make typing while exercising comfortable. The FitDesk also features a storage drawer, and an easy-to-read digital resistance meter that tracks mileage, calories, and time. So if you’re looking to sneak some exercise into your busy schedule, or just want to get in a valuable workout in the most painless way possible, the FitDesk FDX 2.0 might be just what you’re looking for. Sold at amazon.com for just under 300 bucks, this might just be the first piece of exercise equipment you actually use.